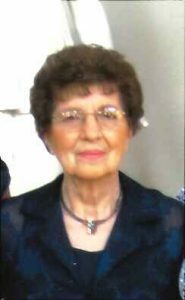 Gladys A. Pernicek, 88, of David City, died Friday, September 16, 2016, at the Butler County Healthcare Center in David City. Mass of Christian Burial Wednesday, September 21, 2016 10:00 A.M.
Gladys was born December 13, 1927, in Rising City to Frank and Pauline(Andel) Liskovec. She attended Rising City Schools. On December 30, 1948, she married Ernest Pernicek at St. Mary’s Catholic church in David City. They farmed near Abie until moving to David City. She had worked not only on the farm but for 30 years at Henningsen Foods in David City. She loved gardening, baking, playing bingo and dancing. Gladys is survived by four daughters;Diane(Jim) Bartlett and Carol Pernicek, all of Lincoln, Connie(Richard) Wachal of Schuyler, Donna McDonald of David City, one son Mark(Dianne) Pernicek of Octavia, 7 grandchildren, 13 great-grandchildren, two sisters-in-law, Mary Ann Pernicek of Schuyler and Rose Jambor of David City and many nieces and nephews. She was preceded in death by her parents, husband, an infant daughter, Lori Ann, three sisters;Mary Cihal, Clara Slosser and Emma Voboril and two brothers, Johnny Liskovec and Bill Liskovec.